The discovery of a two-pack box of original Cheerios in the office's stash of munchies brought me back to a childhood memory today. 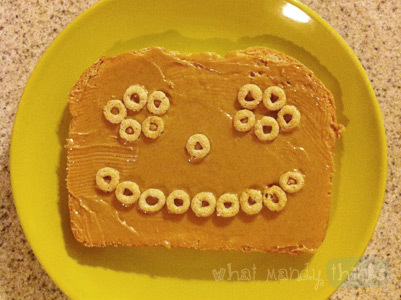 As kids, me and my sister would have a snack called "Peanut Butter Faces" which consists of a piece of bread, peanut butter, and Cheerios . The Cheerios make the faces stuck to the peanut butter slathered onto the slice of bread and it was the best thing ever. My SPOTD today is this nostalgic snack. When your food smiles back at you, it'd better taste great. - It brings you back to those fantastically naive days where the greatest accomplishment of your day was finishing your peas BEFORE everybody left the dinner table. - Childhood food is almost always not very good for you, but it never stopped tasting as good as it did back when the food's preparation seemed as complicated as a steak dinner. I guess this was the origin of my "faces in food" habbit. Whenever I eat at a sit-down restaurant and have extra food on my plate, I arrange it into as close to a smiling face as possible so I wouldn't feel so bad for leaving food uneaten. Also I'd hope my server would get a kick out of it. What's a childhood dish or snack you still enjoy preparing every once in a while?